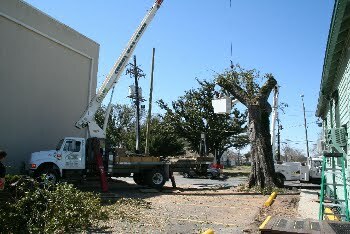 Gordon’s Tree and Crane Service is offering Tree Removal throughout the Southeast Louisiana. We specialize in hazardous Tree Removal. If you have a tree that is uprooting and headed towards your house, shed, etc., we can come and crane it out before it falls and causes damage to your property. We have bucket trucks and climbers for Tree Removals. In some cases if you cannot reach a tree with a bucket truck, we can put a climber in the tree. This is sometimes beneficial for backyard trees. Gordon’s Tree and Crane Service does also have a 90 foot 18 ton Crane do get the job done if needed. Tree Removal is not something you want in amateur hands. Our crews are qualified to remove your tree in with the safest method without damaging your yard or home. One of the things that keep our customers coming back is our cleanup. We pride ourselves on leaving your property nice and clean.